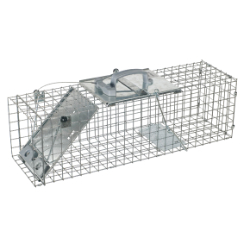 Options: 1084 - 24" 1085 - 32"
Easy Set and Release mechanism, located on top of trap, limits interaction with animal. Trap can be set and released with one hand. High-tensile wire mesh makes trap more durable without making it heavier. Animal-safe design: rolled metal edges and snug fitting doors eliminate sharp surfaces and gaps that could harm the animal. 32.75" x 10.50" x 12.20"